I did a lot of experiments using sulfur dioxide (SO2) when I worked at the University of California in the 1980s. At that time the ways in which it could be oxidised to sulfuric acid (the important acid-rain” ingredient) were not fully understood. I did not realise at the time though that I was working with the world’s first chemical warfare agent. Iceland’s Bardarbunga volcano has been erupting since August 31st 2014. Europe looks on nervously because of memories about the cloud of abrasive ash that was emitted from the Eyjafjallajokull volcano during April and May 2010. That earlier event seems to be different from what is happening now because then much of Europe’s air space was closed for six days, stranding tens of thousands of passengers, including several of my friends and colleagues. 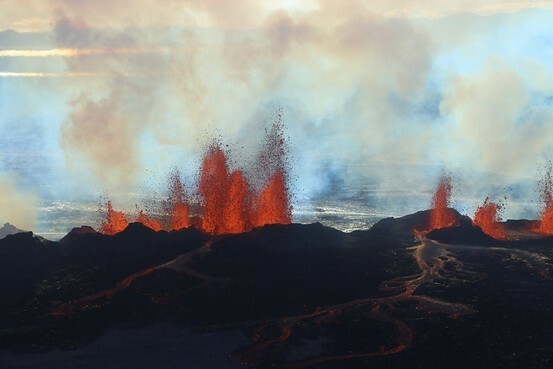 This time there seems to be little ash being spewed into the air; instead molten lava is flowing into the Holohraun lava field in the Icelandic highlands. There it has been recently estimated to emit sulfur dioxide at a rate of ~350-400 kg/s (in other units that is up to 30,000 tonnes per day). In part, the emissions are carried from “toxic tornadoes”, one of which was monitored on September 3rd with a video available on YouTube. The problem is that SO2 gas is very toxic and is putting the health of scientists working close to the eruption site at risk. For example one of them has reported both burning eyes and sore throats. Even more worryingly, soon after the first eruption, residents living further away in the region began to report an unusual stench in the air like old fish. So now the Icelandic Met Office reads forecasts for sulfurous gases along with weather news on national radio and TV. Later the changing weather patterns carried the SO2 plume to Norway and Finland, countries that are more than 1000 km away. And we now know that it also reached Ireland, with a large spike in atmospheric concentrations, on Saturday 6th September. This event was picked up by our EPA Air Quality Index for Health on that day at 19.00 when it indicated that air quality was “Very Poor” in Large Towns. (#aqihIELargeTowns bit.ly/122pU7H). The toxic SO2 plume was monitored at very high levels for a relatively short period of time initially over the Western coast of Ireland. Stations at Ennis, Limerick, and later Wexford, detected >200 microgram/m3 (~75 ppbv) for 3- 4 hours on the 6th for each site. Satellite measurements indicated that the trail was likely even more concentrated in the corridor across the country extending from about Athlone to Boyle. What this shows is that the EPA National system for monitoring pollution events of this type is fit for purpose. But it is not clear if that information gets out in real-time to local radio stations. These news outlets, in particular, could give immediate warnings to susceptible members of the population, particularly children and asthmatics, if they were routinely monitoring the EPA Air Quality Twitter site. Do they? To put this single SO2 event in perspective, current EU Directives set its levels for the protection of human health at 250 microgram/m3 or 132 ppbv over 1 hour (not to be exceeded more than 24 times in a calendar year) and, over 24 hours, 125 microgram/m3 or 47 ppbv (not to be exceeded more than 3 times in a calendar year). And so the event on 6th September posed no real health threat for the general population. Although there are some direct toxic effects of sulfur dioxide for us, as described above, there are also some indirect effects when it is oxidised by other atmospheric ingredients such as ozone when it has dissolved in cloud water droplets. Then sulfuric acid, a principal ingredient of “acid-rain” can be formed. Most often this pollutant is associated with our industrial activities linked with combustion of fuels in the home, on the road or at sea. It must be said though that environmental acid-rain problems are insignificant compared to an event in Syria in 256AD when the Roman Fort at Dura was laid to siege by the Ancient Persians. The defending Roman soldiers there all died from the release of SO2 in the tunnels under the fort and so their deaths have been linked to the likely first use of chemical warfare. Air pollution stories always tend to expose us to the negative side of living on planet Earth. But there is a potentially good side to volcanoes erupting and sending large quantities of SO2 into our atmosphere. That is, as long, as they inject it directly to about 20-30 km in altitude in our stratosphere. There it can be transformed to sulfuric acid droplets that can reflect the sun’s incoming energy back into space and thereby lead to a medium-term, global cooling effect. And considering our predicted climate change future that is a good thing. So good that several highly respected scientists have proposed the GeoEngineering of our stratosphere by transporting sulfur compounds there. Three weeks after the initial eruption, Iceland’s Bardarbunga volcano shows no sign of calming down. Keep checking the EPA Air Quality site, radio programme producers!